Article Bandworld Archives What’s Wrong With Your Right? What’s Wrong With Your Right? The position of the hand in the bell is of utmost importance on horn playing. First of all, it is necessary to understand the “role” of the hand in the bell if we are to realize how important it is as an aid in controlling the tone and the intonation of the horn. The movements of the hand in the bell can raise the pitch of the note, flatten it, mellow a note, mute a note; it can make all the difference between an unpleasant and a beautiful sound. 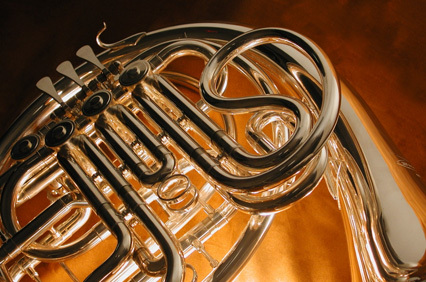 Remember, before valves were added to the French horn, all the chromatic notes were obtained by various position changes of the right hand inside the bell. This can still be accomplished without the use of valves, if the hand position and its use is correctly executed. 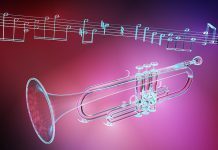 You can test your hand position by playing a scale “with your hand,” sharpen a note, flatten it, mute it, change your tone color from harsh to soft and back again-all the while that you are supporting the horn with the same right hand! There are different conceptions of the position of the hand in the bell, but logically there is only one best way to hold the hand for maximum economy of movement, for the perfect balance of the instrument while the hand is supporting its weight. and for the comfort of the player. First, stretch the fingers out straight, each finger lightly touching its neighbor, including the thumb. Hold the hand so that the palm is facing the body. Now, allow the hand to form a slight cup or pocket-about a quarter cup-with the fingers still lightly touching but close enough together so that no air could pass through the fingers. The thumb, you will notice, is lying along the side of the index finger and reaches quite close to the second knuckle of the index finger-thereby contributing to the shape of the quarter cup of the whole hand. Now place the hand inside the bell of the horn, being sure that the fingers do not separate. Allow the back of the hand to touch the far side of the bell, with the thumb-from just below the large knuckle to the first joint-touching the top of the bell. In this position, you should be able to do two things: you should be able to lift the outer rim of the bell an inch or two up from your right leg, and you should be able to pivot your wrist back and forth about two-and-a-half inches in an opening and closing manner. These two movements done with ease and comfort, will prove that your hand is relaxed, comfortable and free to move as required. In other words, your hand and your wrist are moving on a ball bearing with no wasted motion or awkwardness. Your hand is a smooth-hinged door which opens the bell or closes the bell with an economy of movement and effort. Your hand is a curtain through which sounds become beautiful, round, rich-in the same way that a singer’s throat, tongue, lips, and soft palate lend tone to the sound that the vocal chords make. 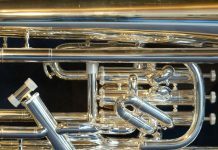 The proper use of the hand, which is a “conductor” of sound, so to speak, is a great aid to the player in getting that mysterious, almost hauntingly elegant sound we so prize in the French horn. The teacher must be careful in teaching the position of the hand in the horn. He must take into consideration the size and shape of the student’s hand. Some hands are short, some long; some fingers thin, some thick. A horn player with a small hand must somehow spread his hand without separating the fingers to prevent escape of air. His tendency is to push his hand too far into the horn’s bell. This creates serious problems of intonation. For muted notes, he must perform almost impossible feats, but the teacher will call his attention to the maximum looseness of fingers he can achieve without separating the fingers. On the other hand, a very large hand must be watched just as carefully, because a too-large hand can block the aperture of the bell too much and cause a tubby, heavy sound when it isn’t wanted, and also throws off the intonation to a disastrous extent. A player with an over-large hand must be taught how to compensate for this by a greater compression of the ends of his fingers without causing tension and strain. A possible solution is the slight overlapping of the four fingers in the case of a fat hand. But the teacher must be the judge of this and must carefully listen always to the sounds his student is making. This, better than anything else, will help him to judge what he must help the student to compensate for-and how. Considering the importance of the position of the hand in the bell, it becomes obvious that the proper hand position must be taught to the beginner right from the start! If a beginner gets a wrong start, it becomes terribly difficult to correct him. The hand position essentially becomes habitual. Because the hand position controls so much of the player’s effectiveness-important parts of the whole system and tone-it is one of the most important phases to master from the very beginning. The more a student experiments with other positions, the more he will realize that there is only one logical and expedient way to hold the hand in the bell if the hand is to accomplish its purposes. 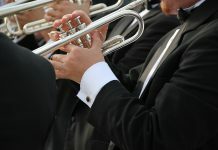 Harry was one of three brothers playing horn in the NBC Symphony Orchestra. He also taught at the Juilliard School of Much and authored A Creative Approach to the French Horn.